Bench Pillows / Table Runners BOM Series! Programs - Most Include Backing! > Bench Pillows / Table Runners BOM Series! If you prefer to order individual kits, these are on our Bench Pillow Kits page. Finished Size: 16" x 38"
Start by making one large "bench pillow" form (instructions included with the kit). 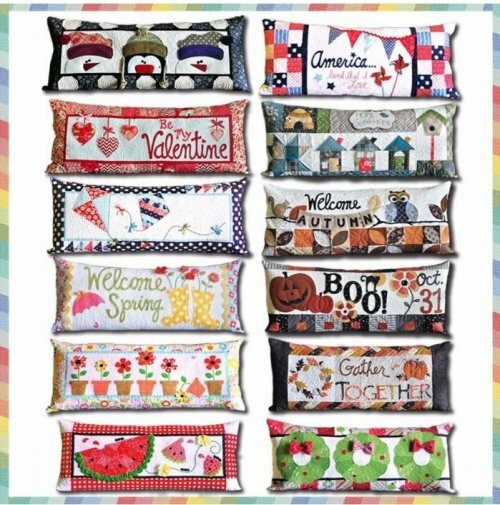 Then change out a new cover for that pillow form for each season or holiday! 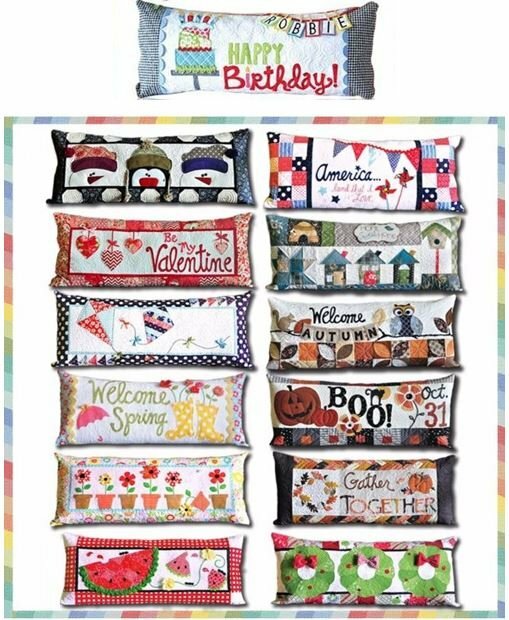 This is the idea behind a new line of patterns for interchangeable bench pillow projects from Kimberbell Designs. Leave out the pillow form and you've got a great tablerunner! • Kit includes perfectly pre-cut and pre-fused applique pieces, the pattern and everything you need to make the pillow cover or a tablerunner. • The fabric for the back of the pillow IS included. • This kit is made with cotton print fabrics, and Heat 'N' Bond Lite fusible. • The Pillow form is not included, but instructions are included in the pattern. • $ 39.99 Reservation Fee pays for your first kit. We will call you to find out which kit you'd like to start with! • $ 39.99 per month for 12 additional months. • You can choose a complete set of all 13 kits (choose the Complete Kit option in the dropdown box above). • $ 19.99 per month for 12 additional months. • You can choose a complete set of all 13 Laser Cut projects (choose the Complete Kit option in the dropdown box above). 13 Projects in Total - Happy Birthday plus 12 Monthly Projects!